Earl is becoming stronger as it passes by the Leewards. 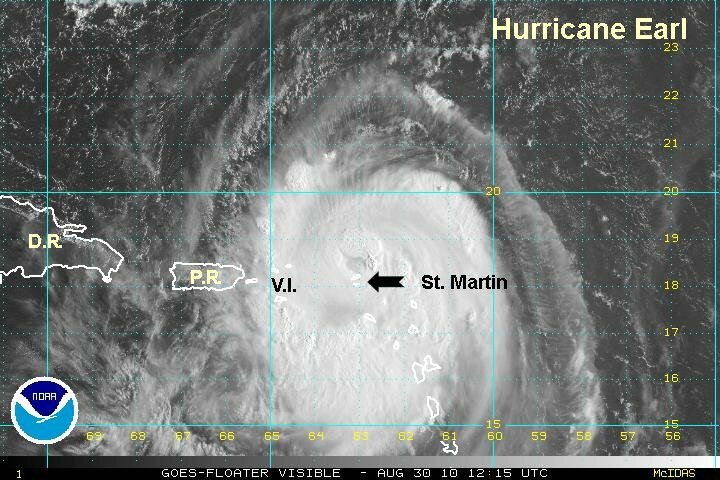 This morning St. Martin reported a wind gust to 61 mph at 7 am....then did not send any report after this. There is a good chance that hurricane force winds will be experienced in the northern virgin islands shortly. 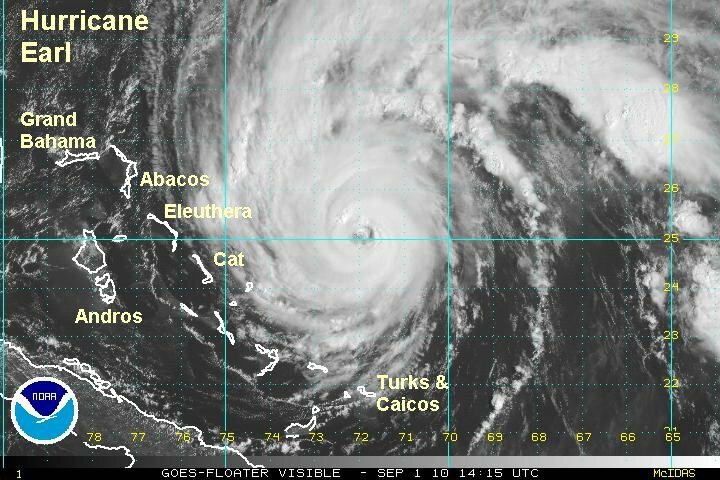 Anegada, Virgin Gorda, and Tortola have the best chance of seeing the strongest winds being the farthest to the north. Several inches of rain with locally 5-10" are possible in the Leewards, the Virgin Islands and Puerto Rico as Earl passes. As of 10 am edt / ast hurricane Earl was centered near 18.5 N / 63.4 W or about 25 miles northwest of Anquilla / 80 miles east of Tortola. Top sustained winds are estimated at 110 mph (110 mph nhc at 8 am advisory). Movement is west northwest at 14 mph. Pressure 960 mb from recon at 10 am. Forecast models have shifted west some. They are turning Earl east of the southern Bahamas by roughly 250 miles. It will be closest to the Turks and Caicos / southern Bahamas on Tuesday afternoon through Wedneday morning. Models have shifted west and have the hurricane near to 100 miles east of Cape Hatteras Thursday and to 50-100 miles east of Long Island Friday to near-100 miles east of Cape Cod late Friday. 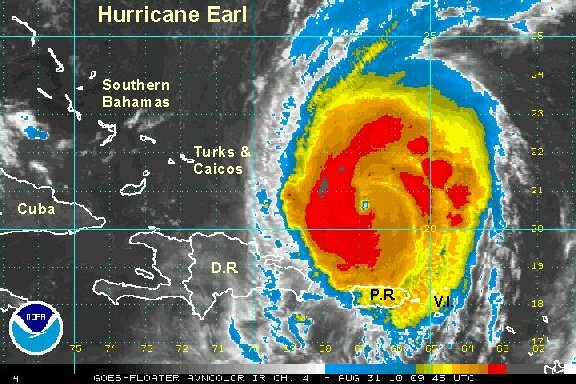 Interests in the Virgin Islands, Puerto Rico, Bahamas, Turks and Caicos, and U.S. east coast should closely follow Earl. Earl has recently taken a jog northwest as it continues to strengthen. It now looks like most or all of the eyewall will barely pass north of the northern Virgin Islands. This is great news. The worst winds of a hurricane are in the eyewall. The Virgin Islands have had winds to tropical storm force in squall bands- mostly in the 40-50 mph range. It is possible that some gusts to near hurricane force could occur in the extreme northern Virgin Islands. Earl has turned slightly over the past few hours. This small northwest jog has allowed the Virgin Islands to be spared the worst effects of the hurricane which are probably 25-50 miles northeast in the middle of the eyewall. Several inches of rain with locally 5-10" are possible in the Virgin Islands and Puerto Rico as Earl passes. Doppler radar has estimated 3-4 inches in parts of central and eastern Puerto Rico with a slow moving rain band. 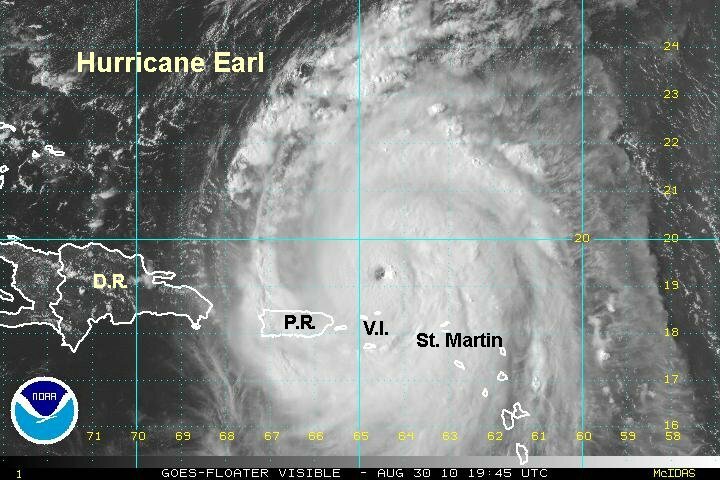 As of 1 pm edt / ast hurricane Earl was centered near 19.0 N / 63.8 W or about 70 miles northeast the northern Virgin Islands. Top sustained winds are estimated at 125 mph (120 mph nhc at 11 am advisory). Movement is west northwest at 14 mph. Pressure 957 mb from recon. 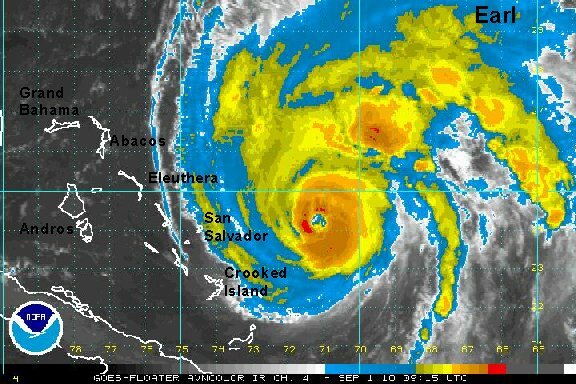 Satellite imagery shows Earl still strengthening as it slowly pulls away from the Virgin Islands. Overall, the northeast Caribbean dodged one here. If Earl was 100 miles farther south the results would be far different than what happened today - heavy rains / localized flooding and some gusts to hurricane force. 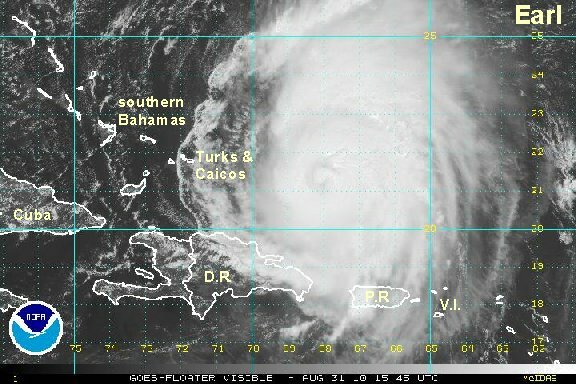 The next area to watch will be the Turks and Caicos later tomorrow. It is very possible that once again the worst effects will not effect land. Several inches of rain with locally 5-10" are possible in the Virgin Islands and Puerto Rico as Earl passes. Doppler radar has estimated 3-6 inches in parts of central and eastern Puerto Rico and south of St. Croix with a slow moving rain band. 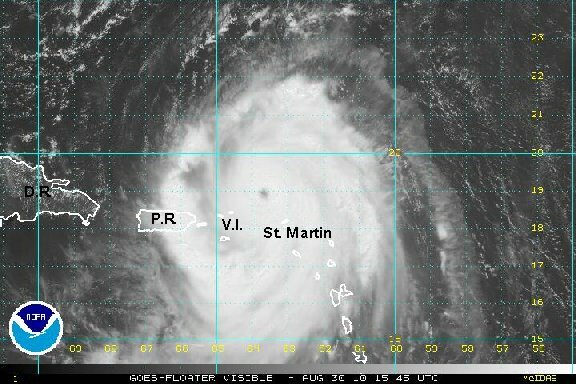 As of 4 pm edt / ast hurricane Earl was centered near 19.3 N / 64.6 W or about 70 miles north of St. Thomas. Top sustained winds are estimated at 130 mph (125 mph nhc at 2 pm advisory). Movement is northwest at 15 mph. Pressure 955 mb from recon. Earl will be closest to the Turks and Caicos / southern Bahamas on Tuesday afternoon through Wedneday morning - about 100-200 miles east. Models have shifted west and have the hurricane near to 100 miles east of Cape Hatteras Thursday and to 50-100 miles east of Long Island Friday to near-100 miles east of Cape Cod late Friday. Earl is in a rapid deepening cycle. The pressure has dropped rapidly and the eyewall has thickened. These are all signs of strengthening. 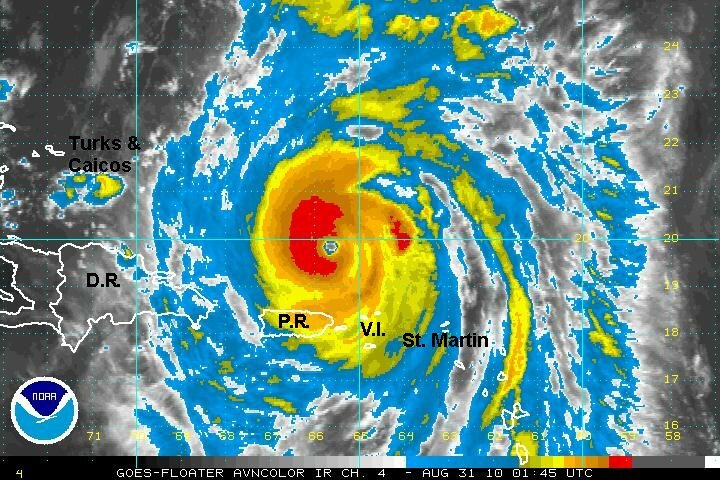 Thankfully the eyewall is now north of Puerto Rico. One rainband is still on the north shore of Puerto Rico bringing heavy rain. Rainfall totals across Puerto Rico into the Leewards have been in the 5-10" range where more persistent bands set up. As of 10 pm edt / ast hurricane Earl was centered near 19.9 N / 65.7 W or about 400 miles east southeast of the Turks and Caicos. Top sustained winds are estimated at 145 mph (135 mph nhc at 9 pm advisory). Movement is northwest at 15 mph. Pressure 938 mb from recon around 9 pm. Earl will be closest to the Turks and Caicos / southern Bahamas on tomorrow afternoon through Wednesday morning - about 100-200 miles east. Models have shifted west and have the hurricane near to 100 miles east of Cape Hatteras late Thursday and to 50-100 miles east of Long Island Friday to near-100 miles east of Cape Cod late Friday. 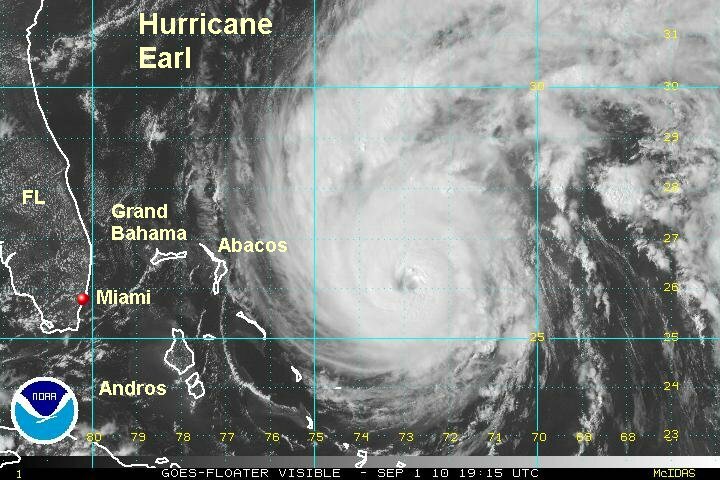 Interests in the Bahamas, Turks and Caicos, and U.S. east coast should closely follow Earl. Earl's pressure has dropped a little more overnight, but it is not in a rapid deepening cycle any longer. It is possible that another strengthening phase will begin as cloud tops are just starting to cool again. Most notably, it looks like the Turks and Caicos / southern Bahamas will only see a brush by Earl. The hurricane force winds will remain to the east. The best chance of seeing tropical storm force winds will be farthest east which is Grand Turk. As of 6 am edt / ast hurricane Earl was centered near 20.8 N / 66.9 W or about 310 east southeast of Grand Turk. Top sustained winds are estimated at 145 mph (135 mph nhc at 6 am advisory). Movement is west northwest at 13 mph. Pressure 931 mb. Earl will be closest to the Turks and Caicos / southern Bahamas late this afternoon into tonight - about 150 miles east. Forecast models are presistent in keeping Earl about 50-100 miles east of Cape Hatteras by late Thursday evening..... to 50-100 miles east of eastern Long Island by Friday afternoon...... to near-100 miles east of Cape Cod late by late Friday evening. Winds will pick up on the Outer Banks Thursday and be at their strongest overnight Thusday night. Tropical storm force winds are expected with the possibility of hurricane force winds if the track is farther west. Interests in the southern Bahamas, Turks and Caicos, and U.S. east coast should closely follow Earl. We are taking winds down some as the eye presentation on satellite is not as well defined. Also, pressure has risen 10 mb up to 941 mb. It is interesting to note that the hurricane center has not adjusted wind speed with the pressure spread of 931 to 941 mb. All things considered, we now agree on the estimated wind of 135 mph. 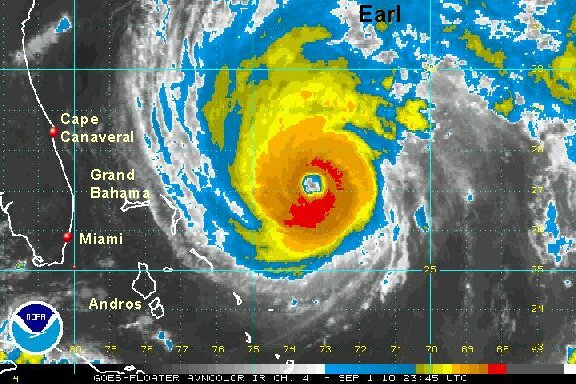 Earl will be making its closest pass to the Turks and Caicos over the next several hours. It looks like some clouds and possibly a few showers will all that will be seen as the hurricane is comfortably to the east just out of range. Great news for the vacationers there. As of 1 pm edt / ast hurricane Earl was centered near 21.4 N / 68.0 W or about 200 miles east of Grand Turk. Top sustained winds are estimated at 135 mph (135 mph nhc at 11am advisory). Movement is west northwest at 14 mph. Pressure 941 mb. Next update will be this evening unless very important changes occur. 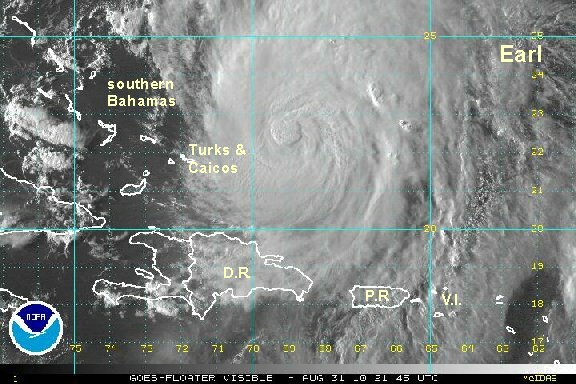 Hurricane Earl has indeed dodged the Turks and Caicos, turning just early enough to take its impacts out to sea. Unfortunately this will not be the case for the eastern U.S. seaboard. Even though the worst of the effects may still remain offshore, the coast will deal with high surf causing beach erosion, impacts of wind to some of the coastline and heavy rain. The most likely coasts to receive significant impacts are North Carolina and eastern Massachusettes - Cape Cod. Earl has not changed appreciably in strength today. Pressure has been nearly steady around 940 mb. Because of this wind estimates have not changed either. A buoy not too far from Earl reported seas at 26 feet. Seas up to 40 feet are possible in the eyewall. As of 7 pm edt / ast hurricane Earl was centered near 22.4 N / 69.0 W or about 970 miles south southeast of Cape Hatteras, North Carolina. Top sustained winds are estimated at 135 mph (135 mph nhc at 5 pm advisory). Movement is northwest at 14 mph. Pressure 940 mb. A hurricane watch is posted for the coast of North Carolina. Forecast models take Earl about 50 miles east of Cape Hatteras by late Thursday evening - early Friday morning..... to 100 miles east of Long Island by late Friday evening...... to near-100 miles east of Cape Cod late by late Friday night - early Saturday morning. Earl is expected to make a long landfall in Nova Scotia, Canada as it parallels the coastline. Winds will pick up on the Outer Banks Thursday and be at their strongest overnight Thusday night into friday morning. Tropical storm force winds are expected with the possibility of hurricane force winds if the track is slightly farther west. It looks like a touch of dry air and some westerly winds aloft have weakened Earl a little. The hurricane nearly went over a buoy a few hours ago. It reported winds gusting to only 100 mph. The recon report was from 3:30 am, so we're thinking that the pressure is going up to but won't know for sure until the next pass. Based on data from the buoy we are going to drop winds. We not going to drop them more than that since it is possible that the strongest part of the eyewall did not pass over the buoy. The hurricane center also commented that their estimate may be high. Buoy data showed Earl moving east of a buoy east of the Bahamas. It reported a wind gust to about 100 mph and seas that were at 49 feet. As of 7 am edt / ast hurricane Earl was centered near 24.5 N / 71.4 W or about 785 miles south southeast of Cape Hatteras, North Carolina. Top sustained winds are estimated at 110 mph (125 mph nhc at 5 am advisory). Movement is northwest at 17 mph. Pressure 941 earlier recon. 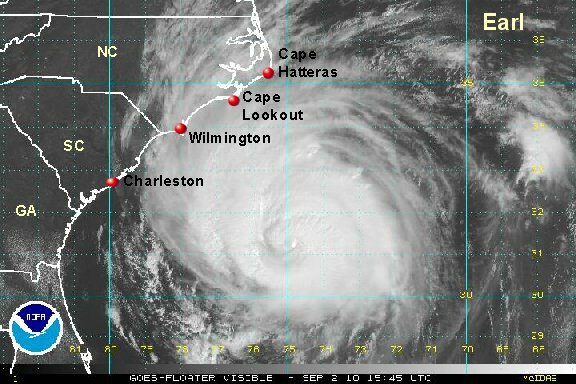 A hurricane watch is posted for the coast of North Carolina and the coast of Virginia. Hurricane preparedness should be completed on the North Carolina coast by noon on Thursday. Winds will pick up on the Outer Banks late Thursday and be at their strongest overnight Thusday night into friday morning. Tropical storm force winds are expected with the possibility of hurricane force winds if the track is slightly farther west. The more reliable forecast models have shifted a little to the east. A small shift of 25--50 miles can make a huge difference in the impacts received on the coast. Forecast models take Earl about 50-75 miles east of Cape Hatteras overnight Thursday night..... to 100 miles east of Long Island by Friday evening...... to near-100 miles east of Cape Cod midnight Friday night. Earl is expected to make landfall in southern or central Nova Scotia, Canada Saturday. Cloud tops have started cooling over the past several hours as the CDO - or central dense overcast has become more symmetrical. The CDO is the circular cloud aread around the eye of a hurricane. These are signs of strengthening. We now think that Earl has strengthened back to 125 mph and are on the same page as NHC. Earl will likely become a cat 4 hurricane later today if this trend continues. As of 11 am edt / ast hurricane Earl was centered near 25.1 N / 72.1 W or about 725 miles south southeast of Cape Hatteras, North Carolina. Top sustained winds are estimated at 125 mph (125 mph nhc at 11 am advisory). Movement is northwest at 17 mph. Pressure 943 mb. The cloud top cooling that was observed in our previous update did continue today allow for Earl to reach category 4 again. It is passing east of the northern Bahamas with almost no noticable effects except high than average swell. 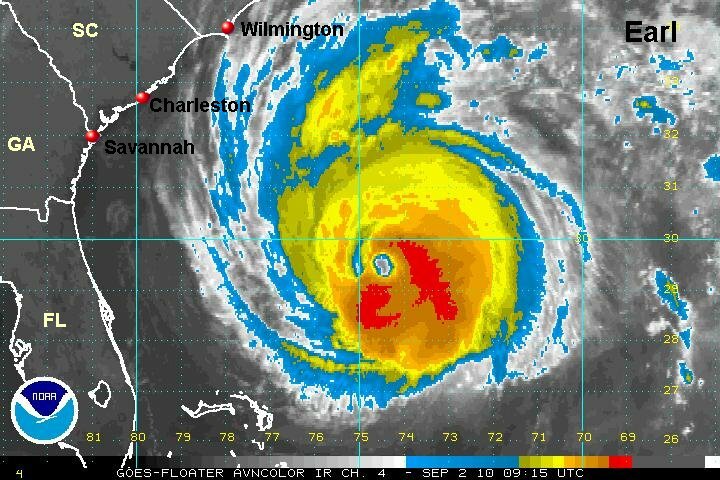 As of 5 pm edt / ast hurricane Earl was centered near 26.3° N / 73.3° W or about 630 miles south southeast of Cape Hatteras, North Carolina. Top sustained winds are estimated at 135 mph (135 mph nhc at 5 pm advisory). Movement is northwest at 17 mph. Pressure 941 mb. A variety of watches and warnings are now posted from North Carolina north to the Massachusetts coasts. Cheack the official national hurricane center link below for that information. Winds will pick up on the Outer Banks late Thursday and be at their strongest overnight Thusday night into friday morning. Tropical storm force winds are will occur inland 50-100 miles with huricane force winds likely on the Outer Banks and possibly farther north. Pay close attention to the positioning of the hurricane warnings and local emergency advisories! Forecast models have shifted slightly east again today....they now take Earl about 50-100 miles east of Cape Hatteras overnight Thursday night..... to 100-150 miles east of Long Island by Friday evening...... to 50-125 miles east of Cape Cod midnight Friday night. Earl is expected to make landfall in southern or central Nova Scotia, Canada Saturday morning. Based on cloud top cooling in the eyewall we think that Earl is still strengthening. At the same time, it has finally started a turn to the north northwest a few hours ago. Earl is pulling away from the northern Bahamas with only some clouds remaining over the Abacos. As of 9 pm edt / ast hurricane Earl was centered near 27.3° N / 73.5° W or about 555 miles south southeast of Cape Hatteras, North Carolina. Top sustained winds are estimated at 140 mph (135 mph nhc at 8 pm advisory). Movement is north northwest at 17 mph. Pressure 941 mb. A variety of watches and warnings are now posted from North Carolina north to the Massachusetts coasts. Check the official national hurricane center link below for that information. Forecast models have shifted slightly east again today....they now take Earl about 50-100 miles east of Cape Hatteras overnight Thursday night..... to 100-150 miles east of Long Island by Friday evening...... to 50-125 miles east of Cape Cod midnight Friday night. Earl is expected to make landfall in southern or central Nova Scotia, Canada Saturday morning. A small shift of 25--50 miles can make a huge difference in the impacts received on the coast. Earl finally leveled off in the mid range of a powerful cat 4 hurricane. Dry air is present on the western side of the circulation - quite close to the eye. If the dry air could get entrained into the circulation it would weaken Earl significantly. For now though that is not happening. The first of the rain bands is just starting to show up on radar southeast of the North Carolina coast. This first band of rain will be moving into the coast by later this morning or early afternoon. It looks like Earl has turned a little again and now is moving north. We are going to deviate from NHC's nnw motion. Pressure is down to 928 mb... only a handfull of hurricanes get this strong. We will be watching the pressure closely to gauge the strength of Earl. As of 6 am edt / ast hurricane Earl was centered near 29.8° N / 74.5° W or about 380 miles south of Cape Hatteras, North Carolina / 840 miles south southwest of Nantucket, Massachusettes. Top sustained winds are estimated at 145 mph (145 mph nhc at 5 am advisory). Movement is north at 18 mph. Pressure 928 mb. A variety of watches and warnings are now posted from North Carolina north to Nova Scotia. Check the official national hurricane center link below for that information. Winds will pick up on the Outer Banks later this afternoon and be at their strongest overnight Thusday night into Friday morning. Tropical storm force winds are will occur inland 50-100 miles with huricane force winds likely on the Outer Banks and possibly farther north. Pay close attention to the positioning of the hurricane warnings and local emergency advisories! Forecast models take Earl about 50-75 miles east of Cape Hatteras overnight Thursday night..... to 100-150 miles east of Long Island by Friday evening...... to 50-100 miles east of Cape Cod midnight Friday night. Earl is expected to make landfall in southern Nova Scotia, Canada Saturday morning. A small shift of 25--50 miles can make a huge difference in the impacts received on the coast. As we stated in our late update we'll be watching the pressure closely. The pressure has jumped to 943 mb from 928 mb. That is a definite sign of weakening. When the hurricane center posted their advisory a short while ago they showed a pressure of 932 mb. No doubt if they had the latest information from the hurricane hunters they would have dropped the winds more. The reason that we are keeping it at 125 mph is because hurricane tend to have a lag time when pressure rises or falls rapidly. The hurricane center also adjusted their motion to north as we noted earlier. This motion should keep Earl in the 50-75 miles distance from Cape Hatteras as the forecast models have been suggesting for awhile. Way to go forecast models! As of 12 noon edt / ast hurricane Earl was centered near 31.5° N / 74.8° W or about 265 miles south of Cape Hatteras, North Carolina / 730 miles south southwest of Nantucket, Massachusettes. Top sustained winds are estimated at 125 mph (140 mph nhc at 11 am advisory). Movement is north at 18 mph. Pressure 943 mb. Forecast models take Earl about 50-75 miles east of Cape Hatteras overnight Tonight..... to 100-150 miles east of Long Island by Friday evening...... to 50-100 miles east of Cape Cod midnight Friday night. Earl is expected to make landfall in southern Nova Scotia, Canada Saturday morning. A small shift of 25--50 miles can make a huge difference in the impacts received on the coast. The hurricane center dropped winds to match our 125 mph estimate on their new advisory. Earl has continued weakening into this evening with top sustained winds now at 115 mph. A large area of rain associated with the core of the hurricane is near the coast from Cape Hatteras to Cape Lookout. The strongest winds reported are gusts to 30 mph at Cape Hatteras. 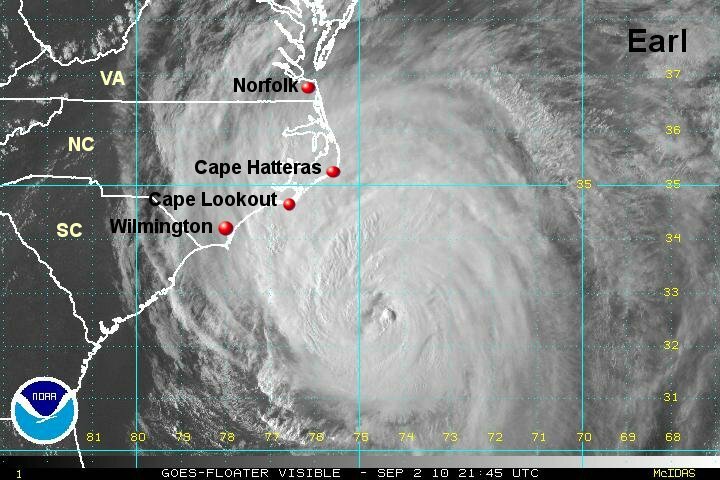 It appears that the worst of the hurricane will pass offshore of the Outer Banks. Conditions will continue to worsen tonight with the worst between midnight and early tomorrow morning on the Outer Banks. As of 7 pm edt / ast hurricane Earl was centered near 32.8° N / 74.7° W or about 175 miles south southeast of Cape Hatteras, North Carolina / 660 miles south southwest of Nantucket, Massachusettes. Top sustained winds are estimated at 115 mph (115 mph nhc at 5 pm advisory). Movement is north at 18 mph. Pressure 948 mb. Winds will be at their strongest overnight tonight night into Friday morning. Tropical storm force winds are will occur inland 50-100 miles with huricane force winds likely on the Outer Banks and possibly farther north. Pay close attention to the positioning of the hurricane warnings and local emergency advisories!